Yes, we know it's Monday and we usually post a joke to start the week. But it's also Memorial Day, and just as we refrain from telling jokes on Yom Hazikaron (Israel's Memorial Day) we're feeling patriotic and grateful to be citizens of this great country and putting off the weekly joke to next Monday. America's Memorial Day got started as Decoration Day because it was a time set aside to honor the nation's Civil War dead by decorating their graves. It was first widely observed on May 30, 1868, to commemorate the sacrifices of Civil War soldiers, by proclamation of General John A. Logan of the Grand Army of the Republic, an organization of former sailors and soldiers. In Israel this day is a very solemn day that precedes Yom Haatzmaut, Israel Independence Day, and is marked by a siren that stops all vehicular and foot traffic for two minutes. On Memorial Day in the USA, while there are commemorations everywhere, shopping and sales have become part of the tradition. 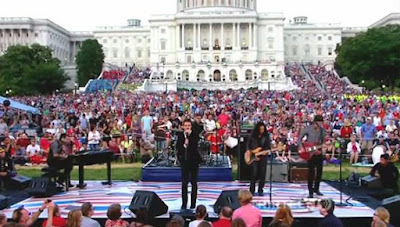 Today we're sharing an excerpt from a Memorial Day Concert in Washington, DC some years back on the Mall in front of the Capitol where Lee Greenwood's song God Bless the USA was performed in front of veterans of all branches of the military. 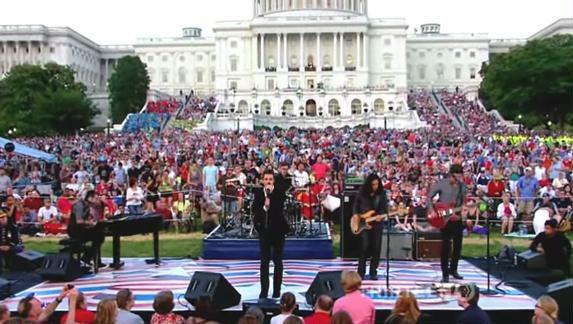 The singer is Kris Allen, winner of the eighth season of American Idol. A Joke to Start the Week - "A Strange Dream"
A Joke to Start the Week - "Praying in Jerusalem"